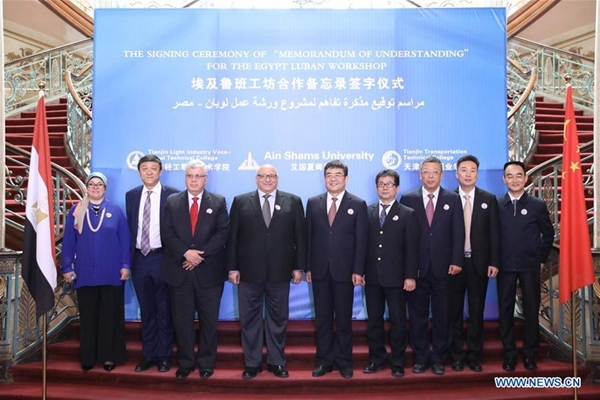 Description：China's Tianjin Light Industry Vocational Technical College, Tianjin Transportation Vocational College and Egypt's Ain Shams University on Sunday signed a memorandum of understanding (MoU) for the Egypt Luban Workshop in Cairo, Egypt. Luban workshop is the first project of international cooperation on vocational training supported by China's Tianjin Municipality, which aims at improving academic education of top technical talents and serving the local economy and society via vocational training. Luban Workshop is a win-win program, which will benefit Egypt and even the whole Arab world, said Song Bo, counselor of education of Chinese embassy in Egypt.